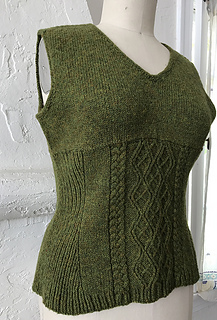 I love twisted stitches and cables and am always looking for ways to incorporate them into my patterns. Tarte Tatin features a twisted stitch center panel reminiscent of an argyle pattern. The colorway, Pippin, brought to mind apples, which in turn led to me thinking of my favorite apple dessert. This vest is worked top down with the body in one piece. The two saddle straps are worked separately; shoulder stitches are picked up from the slipped stitch edges. 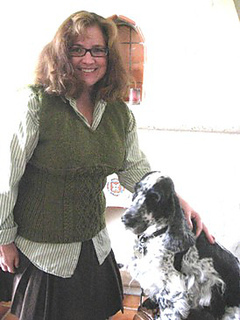 Short row shaping is used for shoulder shaping. Work continues flat until the front neck stitches are cast on, the armhole shaping is complete, and the remaining body stitches cast on. After that it is worked in the round. 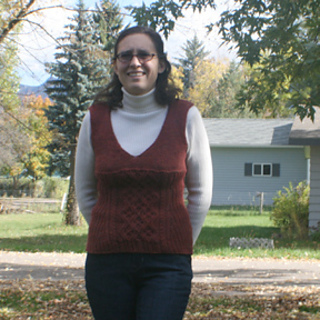 The length of the sweater after the stockinette upper portion is completed is constant across the different sizes. If you prefer the bottom portion to be longer, you can add full 20 row repeats as desired. 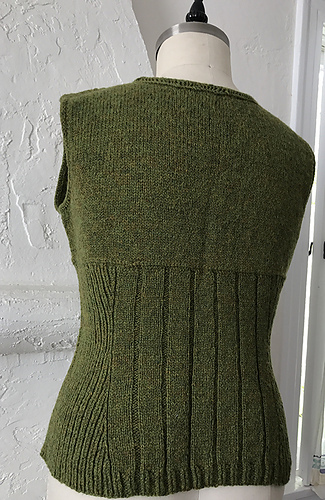 Waist shaping is given in relation to the pattern repeats and specific rounds, rather than to specific distances; thus, row gauge affects the overall length of the vest. Sizes:XS (S, M, L, 1X, 2X, 3X) (shown in size 1X). Between sizes? consider going to the smaller size. 24 sts and 28 rnds = 4” in St st with smaller needles. 20 sts and 28 rnds = 4” in St st with larger needles. 28 sts and 29 rnds = 4” in 2x1 Twisted Ribbing with smaller needles, unstretched. Skills required: Knitting in the round, cabling, twisted stitches, short rows, Vikkel Braid (instructions given). 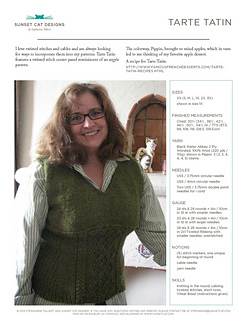 Stitch patterns are both charted and written out. Thank you to Ashley Knowlton for Technical Editing.